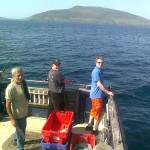 Last year we had a varied time with fishing, whale watching, bird watching and general Family Fun. What about the dolphins ? they are very playful and curious. While you may not be a fisherperson the views of the Kerry coastline are spectacular, very few have seen our county from the sea. The Blasket Sound is a place of rapid currents and big fish I hope we have a calm year again like last year, around mid March I will be starting booking trips for the Spring fishery I will be charging the same as last year €500 charter rate for up to 12 anglers. 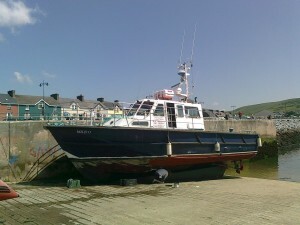 Those of you who would like to learn some boat fishing and are new to this please contact me. I have all the different types of gear you will need and my advice is also freely available. Normally start with some jigging feathers them on to booms and even trolling. 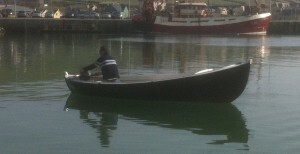 Trolling the bottom is an expirement I will be trying soon, I have 2 Cannon electric downriggers ready to fish. 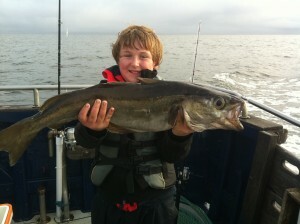 I’m looking forward to this type of fishing around the many peaks in our area. Kids get a great kick out of catching their own fish, adults like it also as we have a ‘Catch & Cook’ plan. you catch it we prepare it you eat it at the local pub now that’s novel ! 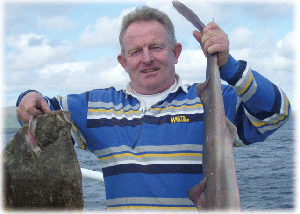 Davey fileting for a ‘Catch & Cook’ night. 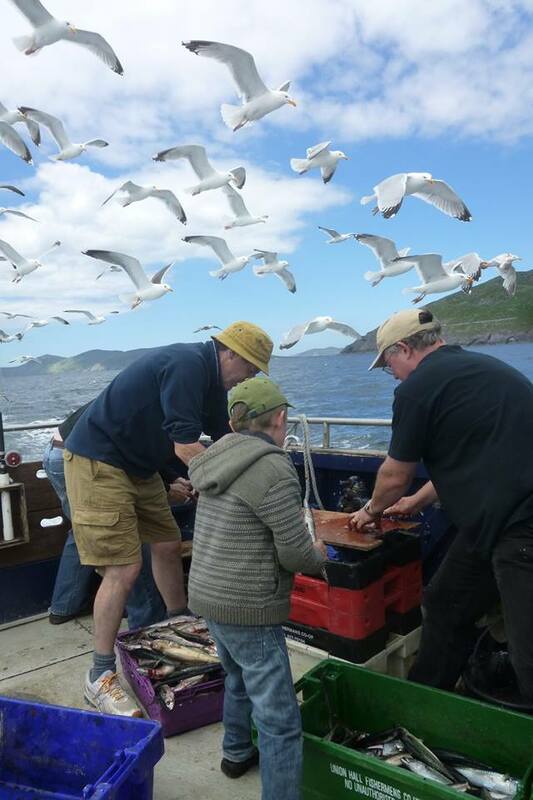 Nothing beats your own Cod Pollack or Mackerel cooked fresh after a day on the water for adults a ‘pint’ or two will complete the experience. So Guys and gals start booking your trip and remember the weekends are usually busy. If you do not have a group 10/12 don’t worry you could join another small group of like minded fishers for a day. 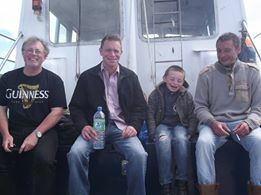 I remember this group we caught good mackerel early, at lunchtime I cooked the fish aboard and in a few minutes I had to return to the galley to cook more, the fish went down a treat, can’t beat fresh, I cook most days that are calm enough to enjoy the meal outdoors on deck. Apart from the fishing we often come across Common Dolphins, Basking Sharks and Whales. 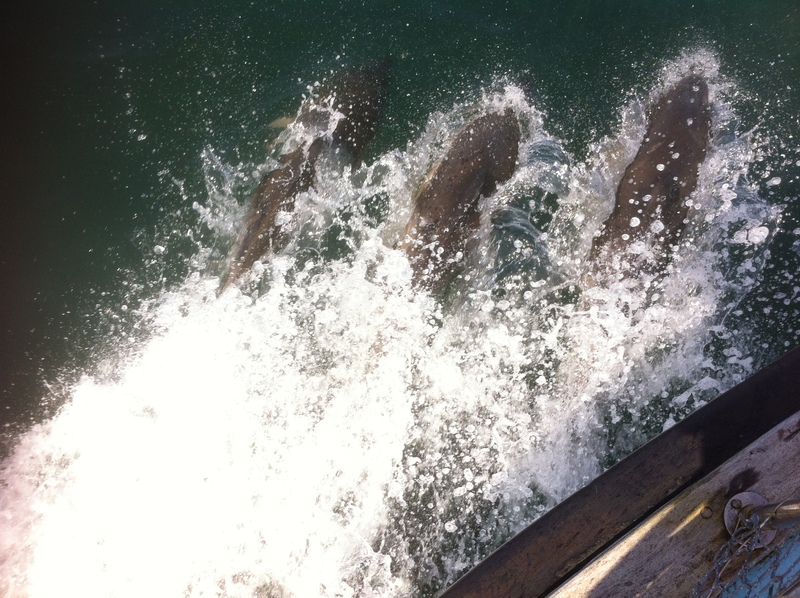 Meeting a pod of dolphins is great as you can watch their antics from the bow as they bump and push each other. 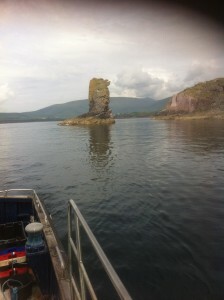 The Searach Rock is east of the harbour and very popular especially for short trips. Full day Charter €500 Half day charter €300or €65 singles, rods and start gear supplied Free ! 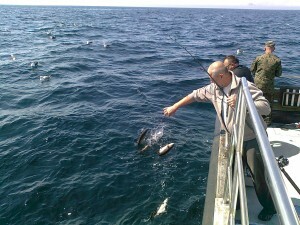 What an amazing June we had with the sea so calm and fish everywhere. 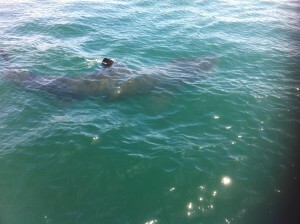 Whales, dolphins and even Sunfish in our waters. During the month I had little time to take photos but the few I have I’m posting them now. 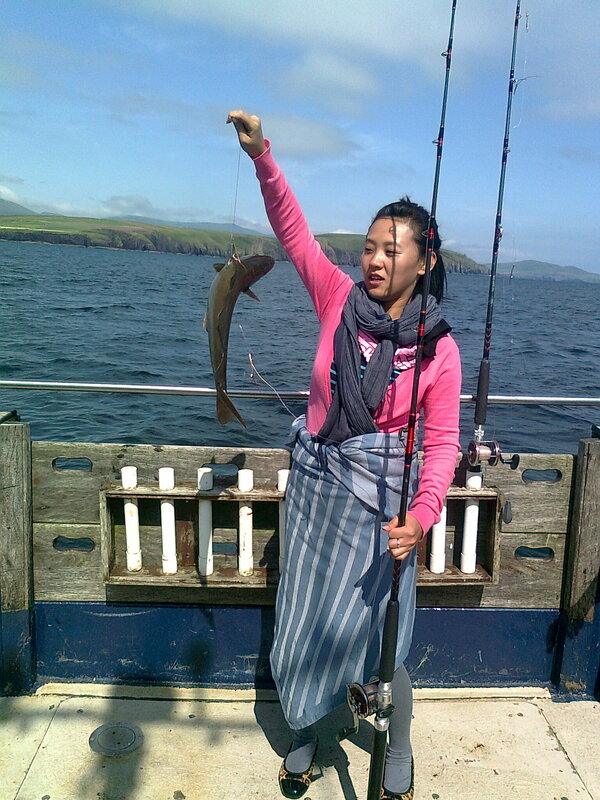 We had great news at the end of the month last Friday the annual Open Angling competition was held here in Dingle. 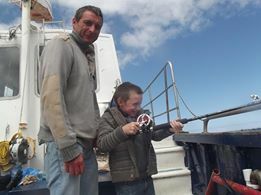 Molly ‘O had 1st & 2nd place Skipper Rory was delighted. 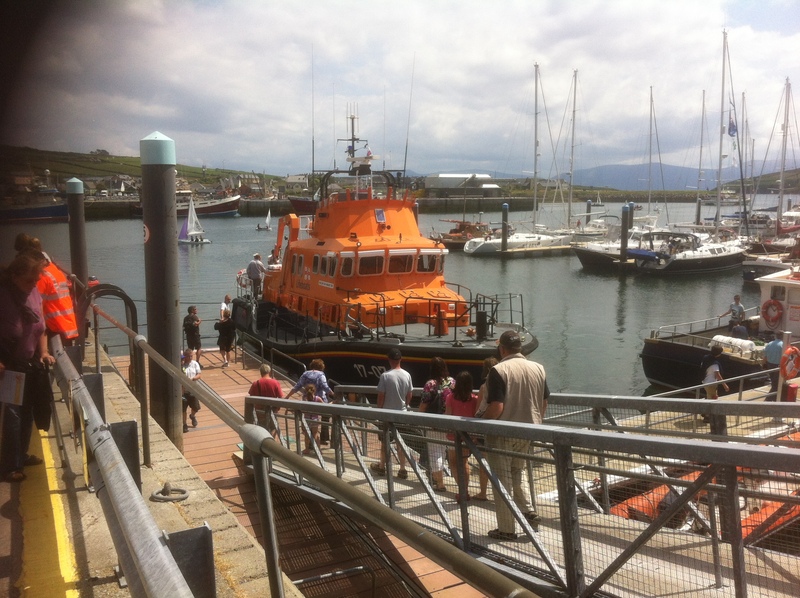 We also had the Blessing of the Boats ceremony on Sunday where the Valentia Lifeboat with the Cannon aboard leads the boats outside the harbour and we all circle the lifeboat as we pass the stern Cannon O’Finnerta blesses each boat, Fungi even turned up and he got a special blessing. My fault if the photos are upside down but this program has changed it’s way of doing things but they forgot to tell me, maybe I was too busy, again more photos. This Esk Tower from about 1 mile south of the harbour on a really nice day. 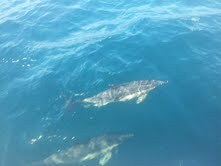 Common dolphins riding the bow wave. 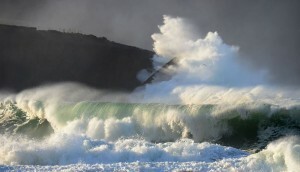 Humpback whale breaching in Dingle Bay last week, wow ! I’ll post more in a few days. Follow us on Facebook. 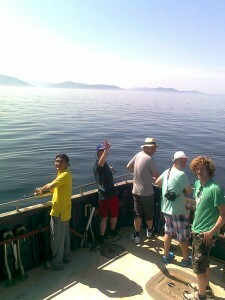 On one of the best days we have had this year we headed out with Michael and his friends from Germany. The wind slight from the SW about F 2/3, blue skies, we were going fishing. 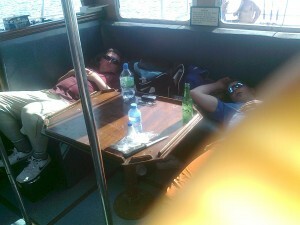 Where is everybody, asleep ???? 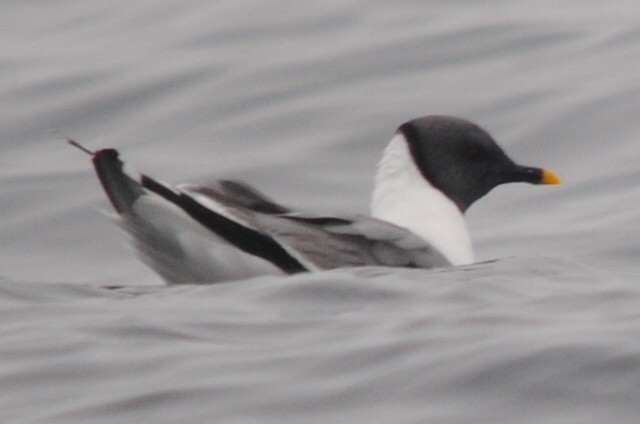 As we passed Parkmore Head we came across a pod of Common Dolphins too numerous to count. 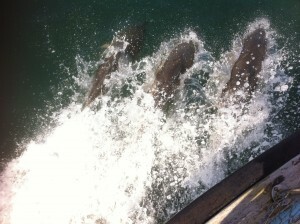 As usual they were very playful and rode the bow wave as we travelled west but we made a 360 turn to keep them with us. The guys were amazed how playful these were. 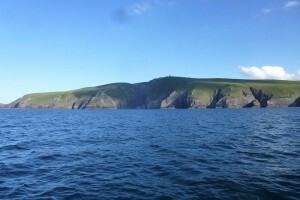 We travelled on to Slea Head the guys were amazed at the history of the are indeed the pre-history, bee hive huts, stone circles all at the Fahan and of course Dun Beag fort. The fort itself took a battering in the January storms. 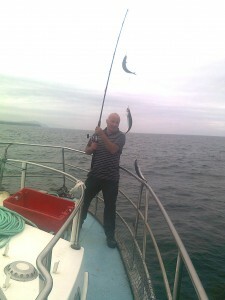 Pollack were soon coming up in 2’s and 3’s most mid size 2 kgs and even a few nice Mackerel. In the distance we saw a Minkie Whale blowing and showing us his back so we hauled up and off to the west to explore. Again more Common Dolphins surrounded us, again we made slow turns and stood out on the pulpit rail looking down at them, ‘what a sight’ the lads said. We broke for a late lunch after all the morning excitement, it was like a picnic setting up a table from fish boxed on deck. I cooked the Mackerel in fillets , the freshest ever and made coffee we all sat down and drifted near Coomeenole beach as we lunched. I’m glad to report that the fishing is back again after the terrible storms of winter and delighted that Pollack, Cod and Mackerel are plentiful. 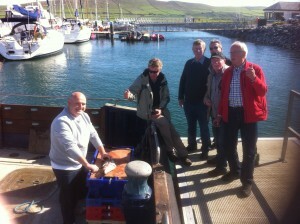 We headed back to Dingle in the evening and we met Davey at the pier who filleted our catch of Pollack, Cod & Mackerel. the boys took them to the Marina Bar where the chef cooked them for Michael & co. We call this ‘Catch & Cook’ and is available all Summer. For the next few weeks the Whales, Dolphins and Basking Sharks will be around Dingle Bay so all you have to do for a great day out is, you guessed it phone me 087 2213900. 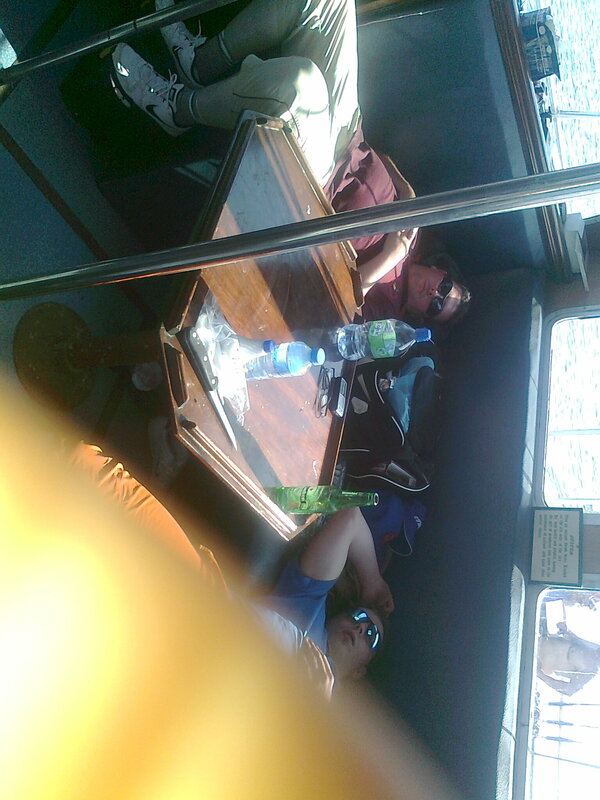 The next post should have more interesting photos. 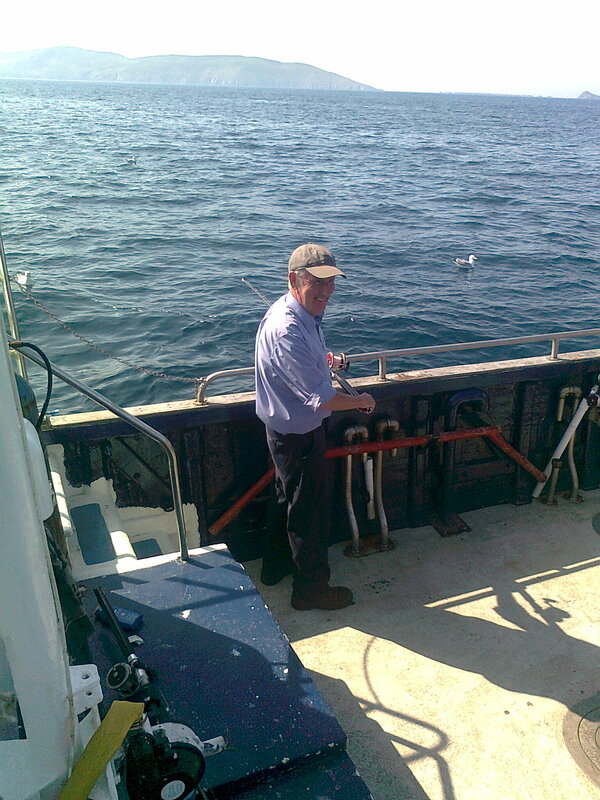 I’m going out fishing for a half day on Thursday and again on Sunday 15th April. I have plenty room on Thursday ans a few spaces on Sunday. Ring or Text 087 2213 900. Weather is improving, days are lengthening and it looks like a good year, be optimistic ! 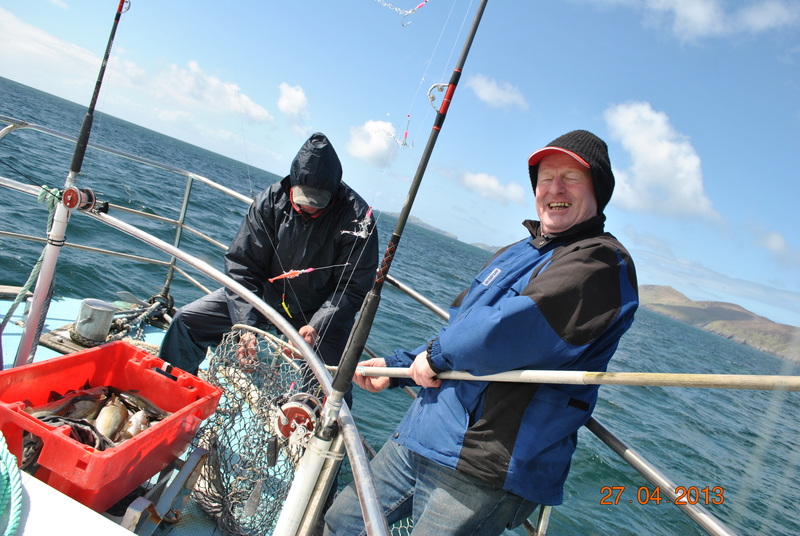 I was out around Dingle Bay before St. Pat’s Day with a bunch of good anglers from Tralee we had a nice day cold but calm but the water is still murky from the storms and therefore the fishing was poor. 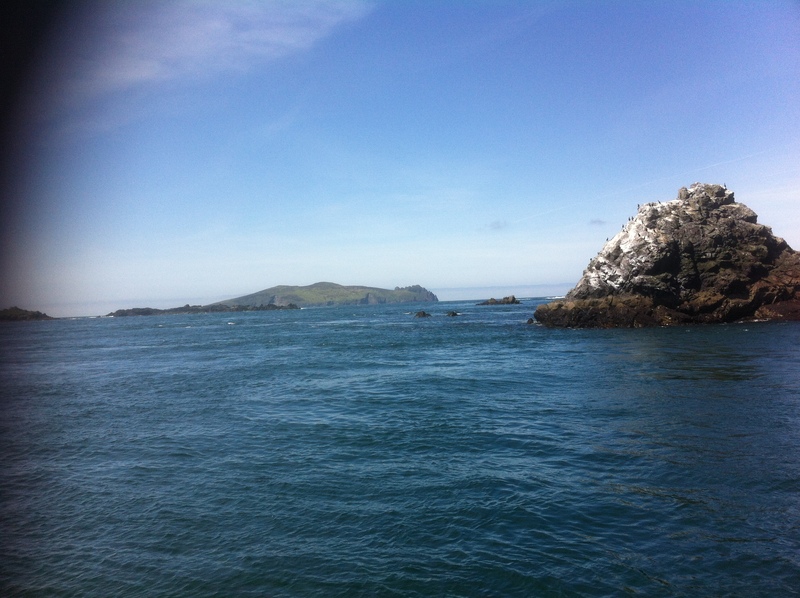 Porpoises and Common Dolphins were 2 miles from Slea Head, nice to see. 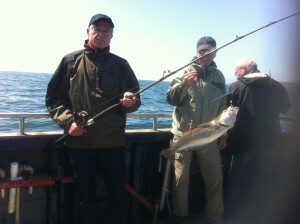 I have promised the guys another day as soon as the catch rate improves. 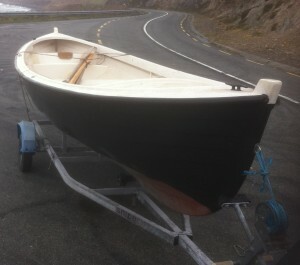 I have a lovely 16 foot whaler for sale with a 4 HP Yamaha & trailer. 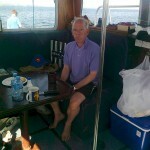 Photos below so now, don’t forget my number is still 087 2213 900. As you know all we had so far was storm and more storms the last one huge. The weather will calm soon as I’m ready to try my Downriggers, trolling off the bottom, never know how it will work but I did a while back in the US it works. 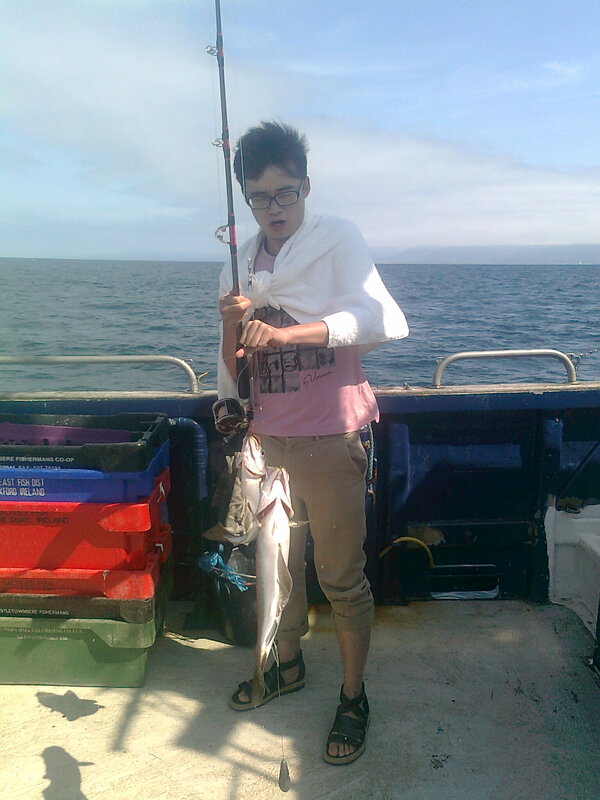 So the next news will be on the D/riggers and what I catch and how many rigs I will loose. In all 2013 was a good year. 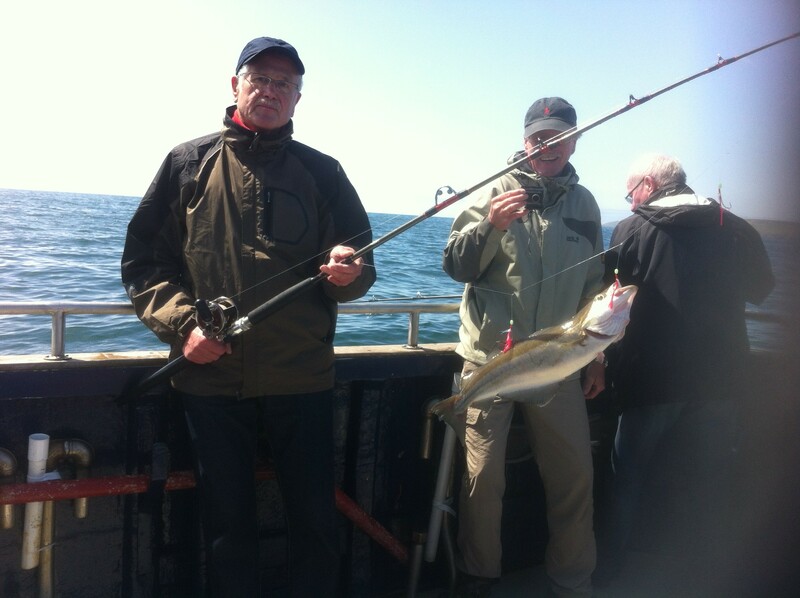 The weather was good which made the fishing good and we had very few cancellations. 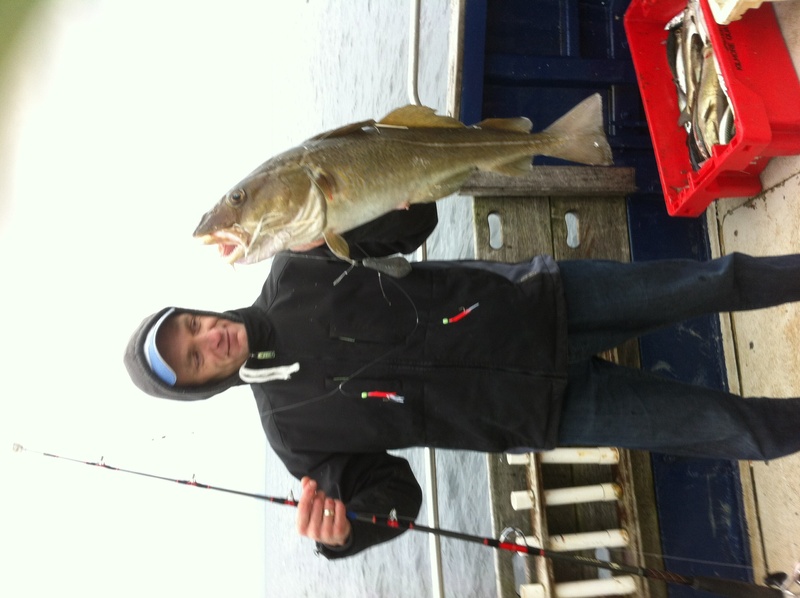 One of my regulars again features in the ‘big fish’ dept., is young David Farrelly a member of the Leinster Angling Team. 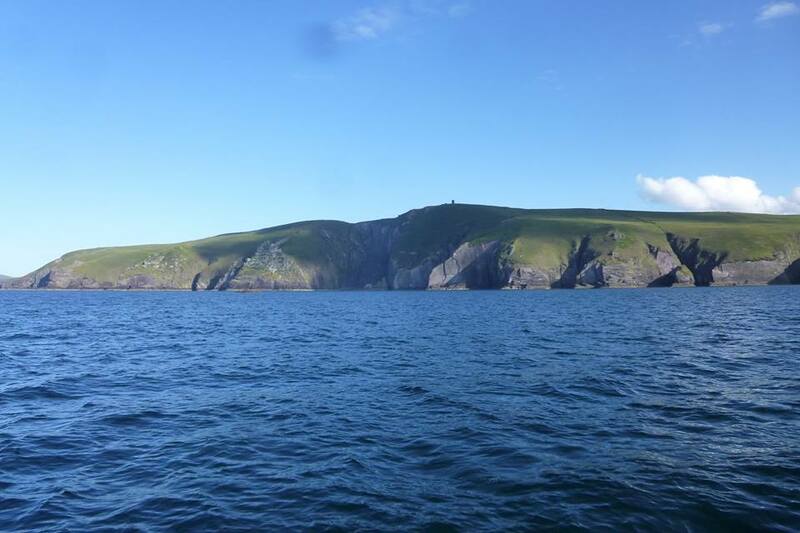 Another feature this year was the amount of whales & dolphins we saw around the Blasket Islands, the rarest were Risso’s Dolphins, we saw a pod of them heading north through the Blackhead Sound. 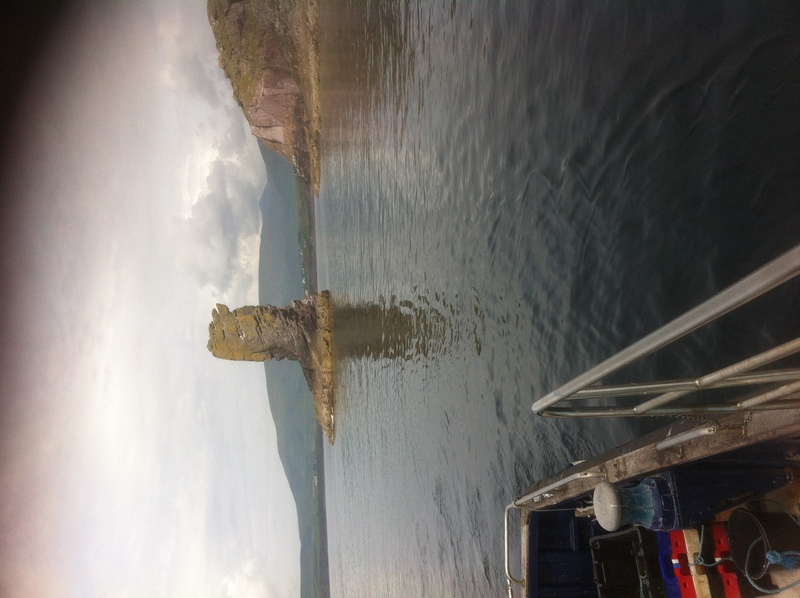 And speaking of wildlife, Ed Carty and his Birdwatchers had a two successful days 4 mile north of the Tieracht Rock, with a lot of sightings. 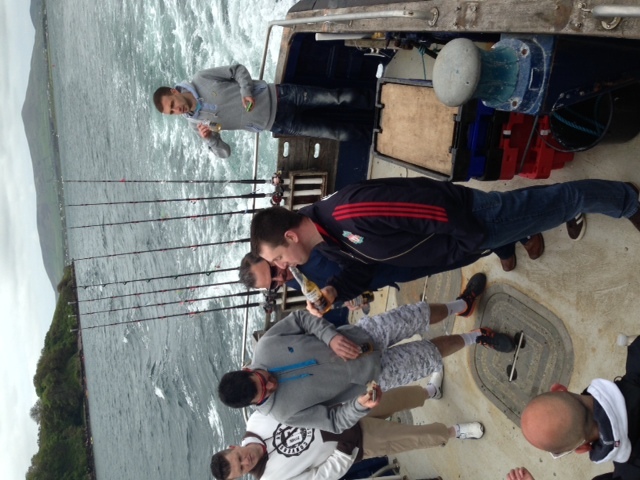 Other photos show how a lot of lads and lassies enjoyed their very ‘first day’ fishing. On one of our last trips we had an amazing day. 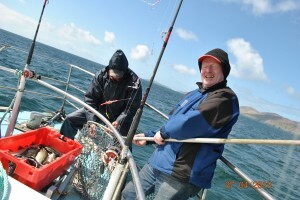 The wind was NE F5 breezy so we skirted along the land towards Slea Head, here we fished for a while with flurries of fish mainly Pollack and Coley with the occasional Mackerel. After lunch the wind died a little so we decided to fish the Wild Bank. On our way out we came across a large mark on the fish finder/sounder. We stopped and I asked the lads all from Killarney area, buddies of G who runs the Killarney Angling shop in the Innisfallen Mall (Big Plug !) area to try the mark. 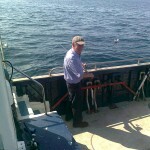 I was amazed at the number of Herring we were hooking along with small Mackerel. 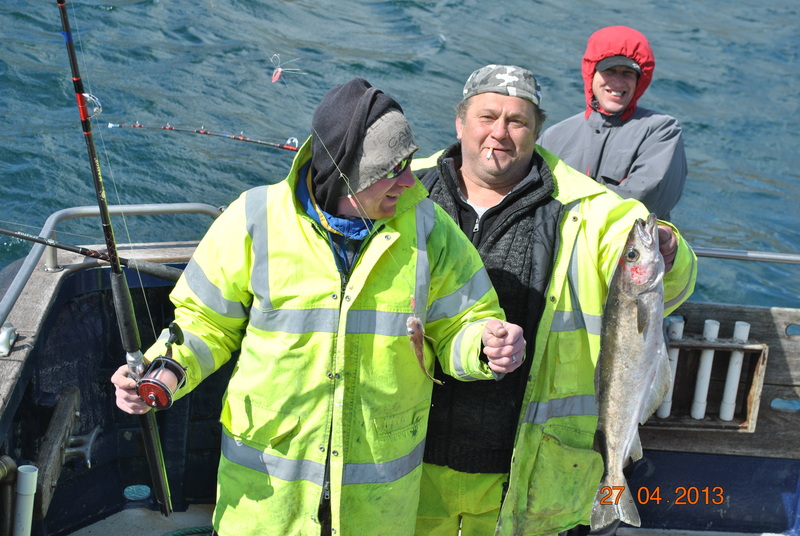 But the wind got up again and it made fishing uncomfortable so the lads asked to go inshore again. On the way in we decided to stop at a well known mark, the Stone House. 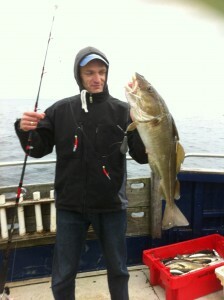 This was again amazing and one of the biggest Cod I saw all week was hooked. 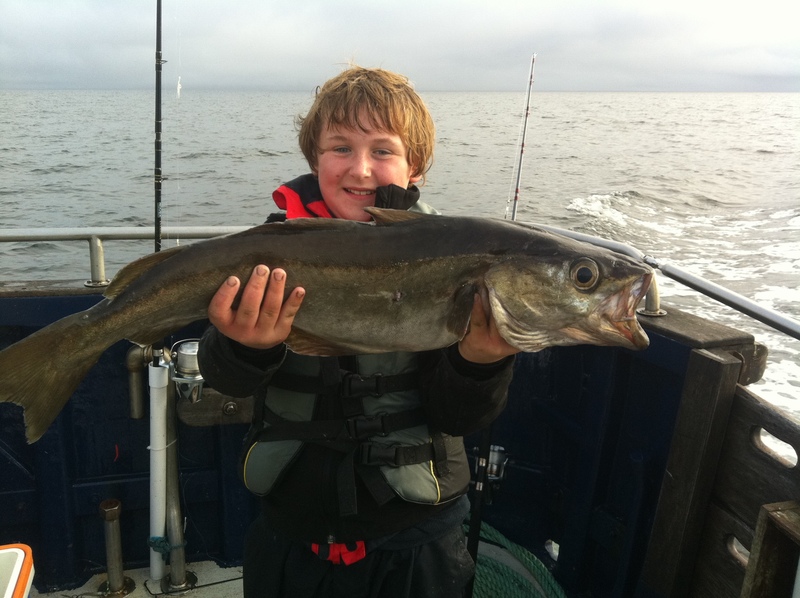 The big Cod, what did it weigh ? 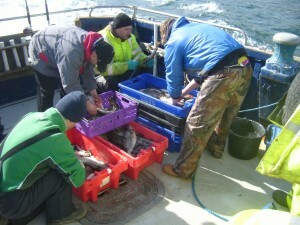 The day produced a number of Ling, Cod including the Big One good Pollack and loads of Herring. 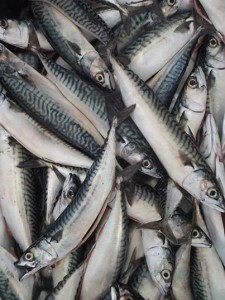 One of the guys brought smoked fish for lunch and I cooked fresh Mackerel, what a great day. Me with the hand net. The lads cleaning the fish. As I sign off although maybe not yet I was given a bit of good advise recently, Never get caught between a rock and a hard place to get out from !!! Dont get stuck on the bottom !!! 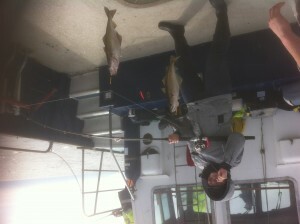 The summer weather continued and so did the fishing although some days were a little better than others, (photo). We had a few Stag days out, here we have the boys at Ciaran stag having breakfast ! Better than a fry up ?? 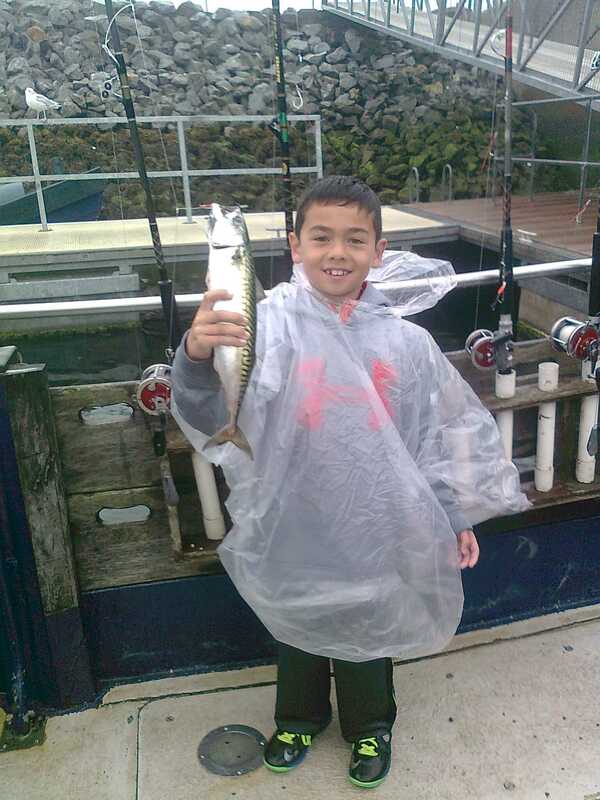 some of our younger members were lucky, what a fine Mackerel. 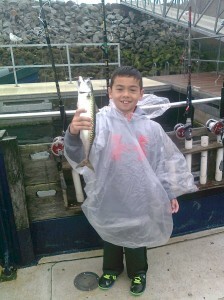 This boy is a champion fisher not his first time out with me, he catches more fish than me ! 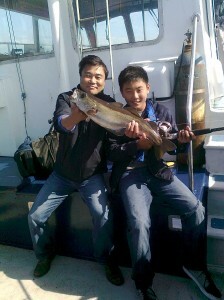 As the year wore on the fishing improved this was the best and we had guys from all nations. 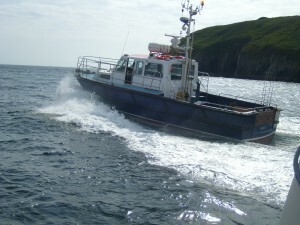 The whales and dolphins were to be seen most days and on the clam days we had great sightings. More soon excuse the lapse ! 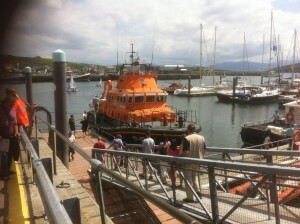 At last after a long wait we have great weather, hardly a need to look at the forecast. Fishing is good for Pollack & Mackerel but only 1 Cod so far this month. WE had a lot of groups during the very hot days the sea was so calm we barely moved on the ground but we caught the tides when we could. 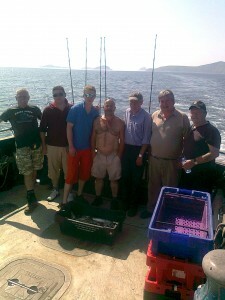 A bunch of lads from the Whitegates Pub in Killarney were out with me as part of the Friday Fishing Club. The day was a laugh a minute with good fishing on the Wild Bank and during the day I cooked up the Mackerel as a treat, as you would expect they were devoured with gusto, and the a small ‘siesta’ for some ! 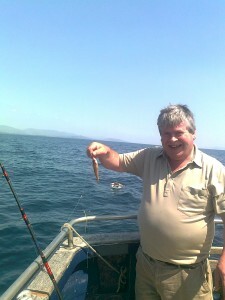 Our well known Dingle man had a ‘monster’ catch. It got bigger in the pub later, ha ha. 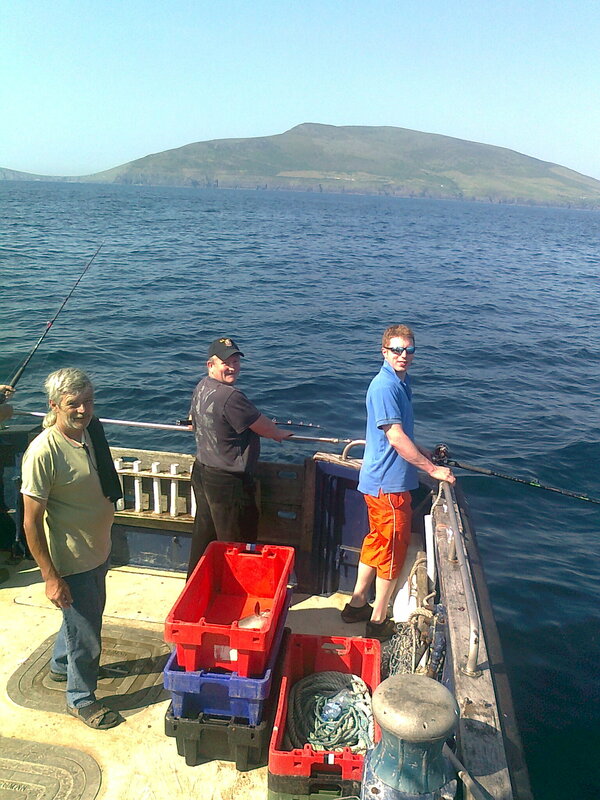 The day was a perfect ‘day out’ and to cap it all the fish was cooked for dinner in the pub that evening, way to go. The week end will be busy and most of the very hot days are now gone but it’s still warm and calm. Next week I will conclude the July post. 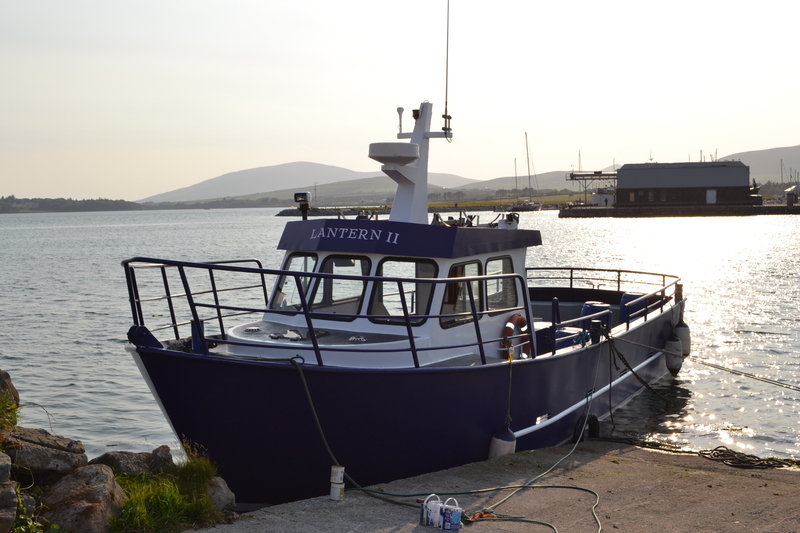 The good news is I have teamed up with Jimmy Flannery and his new angling boat Lantern 2. 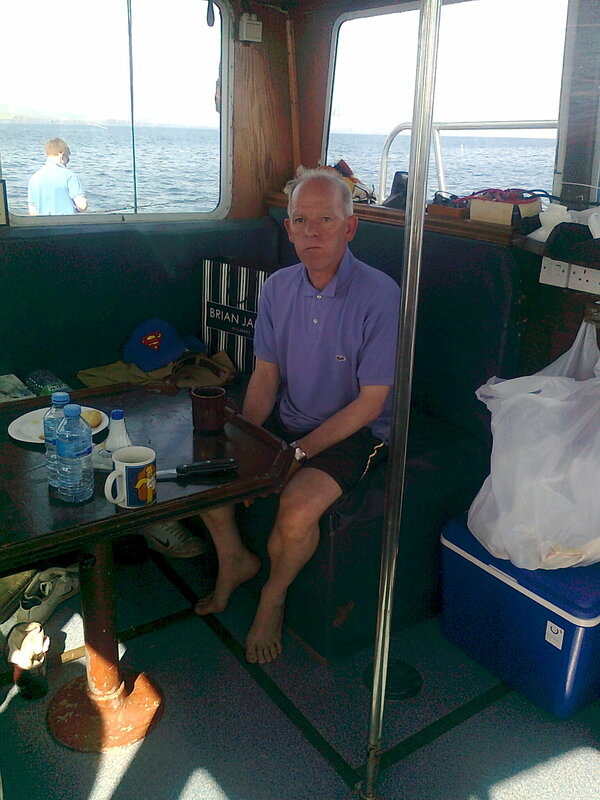 Skippered by the experienced charter captain Tommy Russell, a man of vast knowledge in the angling world. 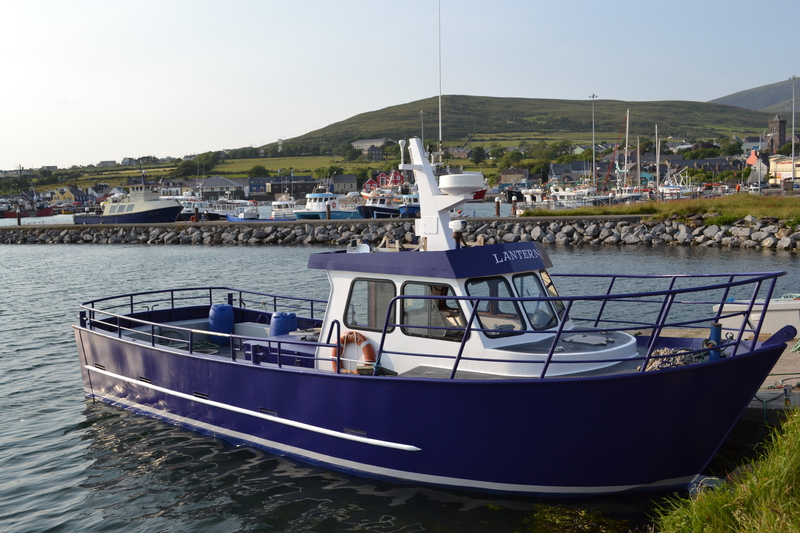 This will be a boost as we now can cater for groups up to 24 passengers. 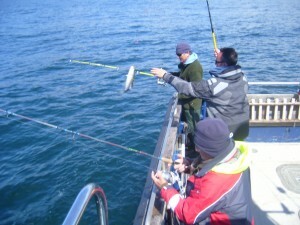 So come on lads and lassies the weather could not be better and the fish ‘are biting’. Lantern II is a steel built boat with a ‘walk around’ wheelhouse and is licenced by the Dept. 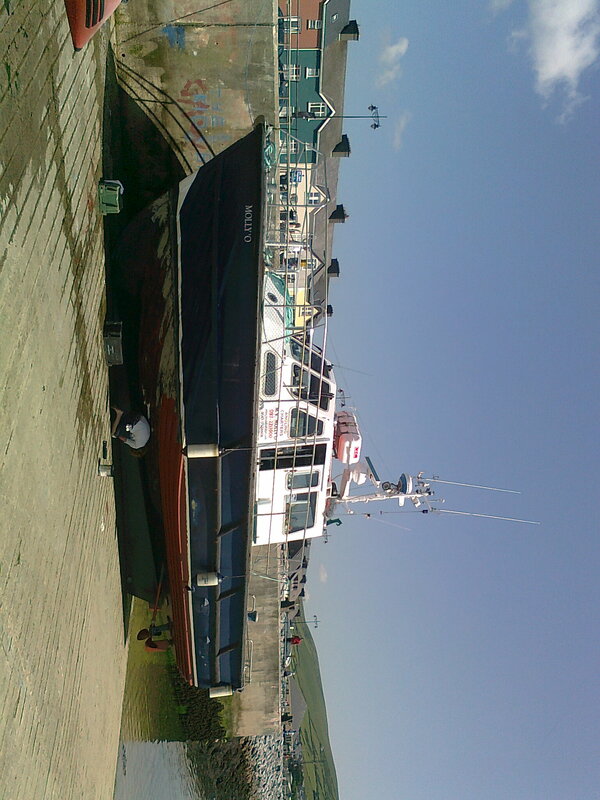 of the Marine for 12 passengers. Good luck to Jimmy & Tommy.